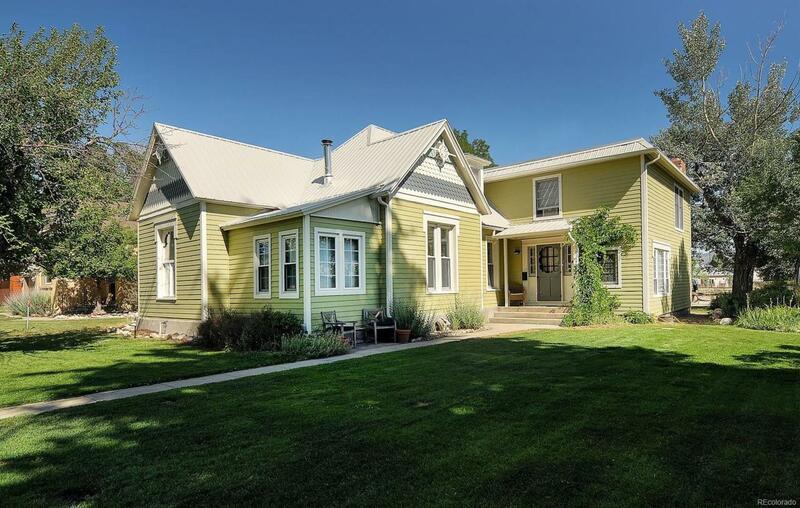 Stunning turn of the century Victorian on the "Mesa." This 2768 SF home has gorgeous hardwood floors, 12' ceilings, crown molding, 2 fireplaces and features 3 large bedrooms (2 have en suite bathrooms) plus a living room, dining room, den, and small sunny flexspace. Beautifully updated kitchen has custom cabinets, stainless steel appliances, 5 burner gas stove and granite counter tops. Tons of storage space throughout this home. Spacious laundry and mudroom includes dog wash/foot rinse. Exterior features new metal roof and newly painted exterior. Fully landscaped yard has lawn with automatic irrigation system, garden, mature shade trees and private patio with retractable awning. Oversized 2 car garage with additional rear parking. The location of the house is truly perfect. 5 mins walking distance to downtown, 1/2 block to golf course, 2 blocks to walking trails but on a very quiet neighborhood street. R-1 zoning preserves neighborhood and nearby development. This one has it all! Offered by Colorado Mountain Realty.